We’re so excited about a big PR win for our client, the Miami Gardens Wine & Food Experience. Among other things, our biggest accomplishment was securing a Food Network feature on an upcoming show on food festivals. 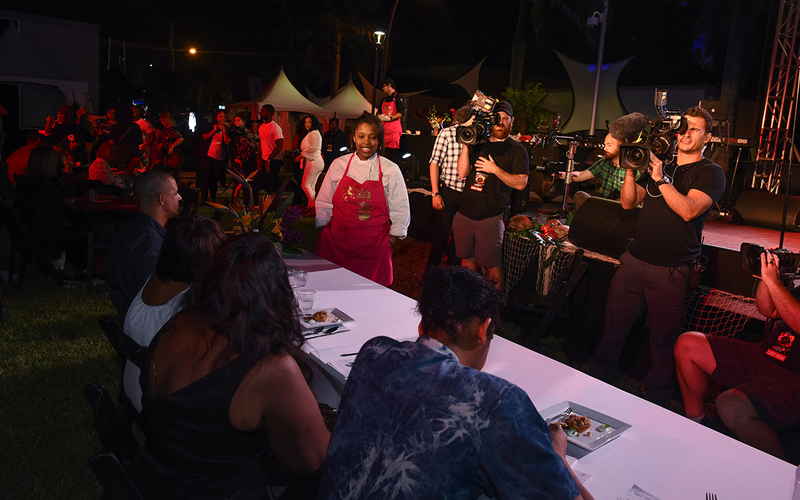 We had a 13-person camera crew on site at the festival taping the Sweet Freak Dessert Competition and capturing the festival experience. And this is only year three of the festival. Talk about when your work produces amazing results! So here’s some context to put this PR win in perspective. Blueprint Creative Group was secured to produce and promote MGWFE, which was on November 11, 2017. We had three months to pull it off (compared to the previous year’s six months planning time) and a DRASTIC budget reduction. So imagine the intense pressure we were under. To add to that pressure, we worked on another food festival at the same time – the 16th annual Grace Jamaican Jerk Festival – and both festivals were only one day apart. Whew! For MGWFE, we were responsible for EVERYTHING – production, vendor management, sponsorship solicitation, logistics, talent procurement, marketing, and PR. So of course this was a major production in addition to having another food festival the following day with an expected 10,000 in attendance. We typically gauge an event’s success by the number of attendees, media coverage, and a flawlessly executed event, and we’re glad to have accomplished all three with MGWFE.